The U10s continued their good form in Cahir and remain unbeaten after another impressive performance. Aiden Maher gave Clerihan the ideal start when he fired a wonderful left-footed shot to the net within two minutes. Clerihan went on to dominate the first half and goals from Cathal O’Mahoney , Micheal Quinlan and Ciaran Moroney ensured a comfortable 4-0 lead at half-time. The second period was more competitive as Cahir pushed on in search of goals and they got their reward with two good goals as the game drew to a close. Cathal O’Mahoney scored a trademark screamer to increase Clerihan’s lead before the home side had the last word with a third goal. The standard of football was very good with both teams doing their utmost to retain possession and build from the back. The difference was probably the tremendous work-rate of this Clerihan squad , which makes it difficult for opponents to find enough space to do too much damage. Both Jack Fitzpatrick and Scott O’Connor deserve a special mention for their solid and composed defending. All other games involving Clerihan teams , namely U12, U14 and u16 were postponed due to waterlogged pitches following the heavy downpour on Saturday morning. 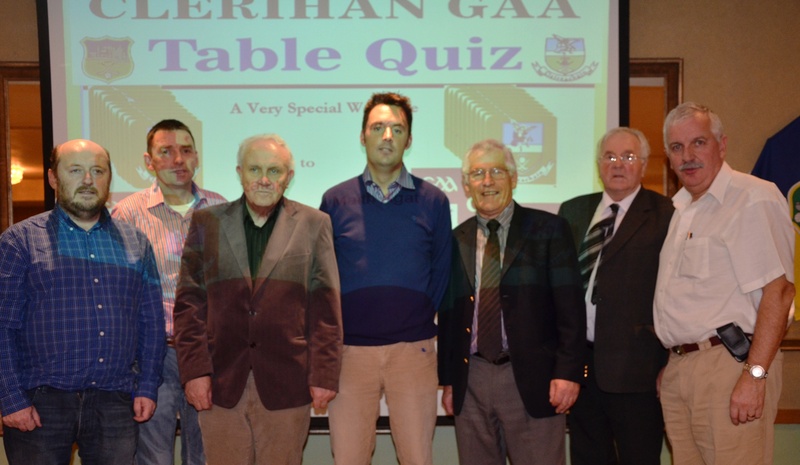 Last Friday night the 18th of November, Clerihan GAA club held a table quiz in the Clonmel Park Hotel. The aim was to raise some funds and the profile of the club. The photo above shows the winners on the night and the presentation party. L-R – Tony Lyons (Club Chairman), Kevin O’Gorman, Sean O’Duibhir, Sean Nugent(County Board Vice-Chairman), Donie McGettigan, Deirmuid Crosse. L-R Tony Lyons (Club Chairman), Michael Flannery (Event Organiser), Paddy Finucane (Tipp FM), Colm Purcell (Club PRO), Sean Nugent (County Board Vice-Chairman), Waltie Moloney (Tipp FM), Joe Conway (Technical Organiser).